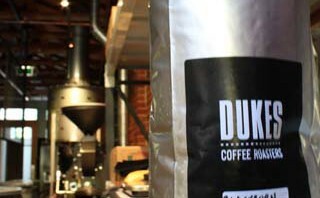 Dukes is ahead of the cafe curve in seeing coffee as the hero, not the side-kick, and embracing permutations beyond the espresso. Speaking of trends, there’s also raw wood, concrete floors and stainless steel, along with knowledgeable staff and an impressive array of equipment to match their skills. A simple but well-chosen breakfast and lunch menu seals the deal. If you’re after something different, try a siphon coffee. My Kenyan estate single origin beans (the recommended choice) is prepared with a Japanese ‘Hario’ siphon. Made in artisanal fashion, it’s one of the best ways to enjoy coffee. The siphon-brewed coffee is a spectacular balance of natural sweetness and an initial hint of citrus, which fades almost immediately into a gentle mid-palate and crystal clean finish. Don’t think you’ll be disappointed with the espresso or latte; both are prepared with the same level of craftsmanship (if not the siphon theatrics). Great to see a trend-setting joint that still keeps up espresso traditions. This entry was posted in testcat and tagged cafe design. Bookmark the permalink.